Regatta Bar & Grille was chosen by OpenTable™ as a Diners’ Choice Winner for 2016, most notably for being the “Most Booked Restaurant in Morgantown.” According to OpenTable™ reviews, Regatta has great food, service and ambiance, making it a favorite in Morgantown on OpenTable™. With scenic views overlooking the Monongahela River, Regatta offers diners an ideal location to complement their delicious menu offerings. Locals and travelers alike are invited to dine at Regatta and see why it’s a favorite in Morgantown. Regatta Bar & Grille, located in Waterfront Place Hotel, is open for breakfast, lunch and dinner every day. With menu options ranging from modern classics to decadent desserts, Regatta has a variety of options to fit everyone’s palate. With outside patio seating or indoor dining, Regatta is perfect for meetings, family gatherings, casual dining or romantic dining for couples. Regatta Bar & Grille also offers a private dining room, great for personal functions, small gatherings rehearsal dinners and parties. For more information or to make reservations, please visit http://www.regattabarandgrille.com or call (304) 284-9850. The Waterfront Place Hotel, located along the Monongahela River in Morgantown, West Virginia, offers guests a beautiful, full-service experience. With 205 deluxe guestrooms and plentiful amenities, Waterfront Place is perfect for business and leisure travelers. Guests may enjoy luxurious bedding, free high-speed Internet, indoor pool, state-of-the-art fitness center, on-site dining at Regatta Bar & Grille and much more. Accommodations include king or double queen rooms, Riverview rooms, suites and accessible rooms upon request. With over 50,000 square feet of meeting and event space, the Waterfront Place Hotel is perfect for conferences, meetings, weddings or special occasions. Conveniently located a short distance to downtown Morgantown, Waterfront Place is a mile from West Virginia University and within easy distance to local golf courses, wineries and much more. 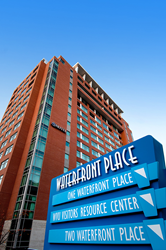 The Waterfront Place Hotel is proudly managed by Stonebridge Companies in Denver, Colorado.